We all know you are serious about your singing career. You've spent the money, gotten the training necessary, practiced for hundreds of hours. Don't let anyone tell you you can't do it. Whether you are singing classical music, folk, pop, or K-pop, HUSTLE is the name of the game. You need 10,000 hours of performing and that is going to take at least five years of performing daily so why not get out there right now? Here are three ways you can get started with the talent, repertoire, and resources you have right now. 1. BUSKING - Check with your city to see what the busking regulations are and then get out on the street and start singing. You can bring something as easy as your portable speaker and a couple of accompaniment tracks. Set out a container for collecting donations and get out there. Make an intention for your performance and take it seriously. Warm up. Don't stay out longer than 90 minutes or so. Make it a habit to get out there a few times per week and you'll start to get some regular fans. Take a video of yourself singing for your little crowd and post it on YouTube. This is free, easy, and fun. Go do it! 2. HOLIDAY SERVICE - Ask your local stores if you can set up outside their or in their mall to do holiday songs while people are holiday shopping. This can go for any holiday really though the winter holidays are the most crowded. Patriotic songs for the 4th of July sale or Memorial Day sales will do very well. Halloween songs for the halloween season. You get the idea. You'll have to speak with a store owner in your local area or to the management of the mall. Libraries, art museums, and community centers are also good places to ask if you can set up and play. You may need to show them a clip of your music and also your repertoire sheet. If you want help with your pitch, take my "Ace the Aud-PITCH-ion" course! It's under the tab: TOOLS. 3. HOUSE CONCERT - House concerts are all the rage these days. Many young musicians do house concert tours. They contact people online or simply contact family members and offer to do a concert in their house if they invite a few people. You can travel the world doing this and make enough to do the travel. Maybe even more! I usually take a collection at the concert to cover my expenses and usually I get more than I need. Try it! OK, so there you are. Three free, easy, and effective ways to jumpstart your career. If you never sing, how can you have a singing career? Conversely, singing anywhere leads to singing everywhere. Get started now. If you've made it to the bottom of this post, congratulations! You must be serious about your career. Let us know what you are doing in the comments section below. Activate your voice today. There are so many people that need a song or a fundraising concert or a consciousness raising concert right now. I have so many friends in Northern California who are suffering from the huge devastation from the fires. They need clothes, undies, shoes, a blanket. I'll bet you could get together a few friends for a concert to collect these items and get them delivered. Puerto Ricans are still suffering without electricity or running water. A concert of Puerto Rican music, or any kind of music, really could do the trick to provide at least a little help to a few families or a couple of kids. All you have to do is find a worthy not-for-profit group who is doing that work and donate your ticket sales to them. What about the undocumented students at your school? They could use a little awareness from the world about what they are going through right now. Or how about a little truth and beauty to stop people fighting over politics for a few minutes. Each and every singer needs more performing hours, more fans, more good will in the world. A concert that you give for others benefits both you and others. It is a win-win proposition. I challenge you go to out today and set up a concert for this weekend, or next. In the spirit of walking the talk, I will organize my voice students at Cal State LA to do the same with their December 2nd Vocal Forum. I'll let you know how it goes. If you do plan some sort of contribution with your singing, please let us know at susan@smkane.com. Get out there and put your voice to good use! 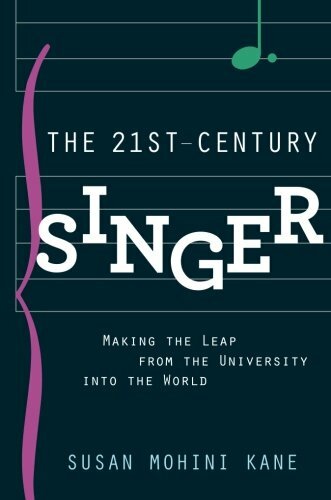 The following is an excerpt from my book The 21st Century Singer: Making the Leap from the University into the World. "Singing has great value to those whose minds clear and muscles relax upon hearing an exquisite rendition of the Lakmé duet. Singing matters to sick children who need calming before or after a difficult surgery. Singing matters to the opera listener who feels uplifted and inspired by the sheer power of the human voice. Singing matters to the dejected who need the message of hope delivered in song. Singing matters to those who need to connect with others in community. Singing matters to patriots filled with love for country at the sound of their national anthems. Classical musicians can serve as healers, community unifiers, cultural ambassadors, brain stimulators, stress relievers, and entertainers. This chapter will help you find the right place for your singing in this 21st-century world that so desperately needs your skill and voice. The movie trailer for this chapter would be like this: in a world where concert halls are empty and computer screens are full the native people, starved for human connection and beauty, are rescued just in the nick of time by one soprano's exalted rendition of Rusalka's "Song to the Moon" in the city square." The world needs that voice and spirit only YOU can give. This article is adapted from a presentation I gave at the International Congress of Voice Teachers in Paris, France in 2009. Though some of the dates are a bit old, the information is still largely correct. The gap I speak of here is that period of years after graduation from conservatory or university and before the singer’s debut at the Metropolitan Opera in New York. This uncomfortable period may last from three to five years as Manhattan School’s Gordon Ostrowski says, or it could last much longer depending on the singer and his or her individual circumstance. As Denyse Graves puts it: “Each singer’s path is different.” To put a slightly better spin on these uncomfortable middle years, we must put them in thecontext of a life: The Student Years – The Apprentice Years – The Professional Years. As you can see there are lots of choices to make during the The Apprentice Years. You might ask yourself: Should I go back to school? Audition for management? Learn a role on my own? Get a church job? Get a day job? First let’s get a perspective on the trends in the field of opera and the performing arts. Young Artist Programs and Studios are highly competitive and highly coveted. Some are year around and others only occur in the summer. This is considered the proper next step between school and management in the US. According to YAP Tracker.com, there were 2484 audition opportunities in the past year for American singers. These auditions included master class participation and competitions as well as for summer “pay-to- plays,” young artist programs and main stage roles for both managed and unmanaged singers. Most organizations for Young Artists and Emerging Professionals require that the singer pay a fee to join. Many offer audition information, career building information, or lists of opera companies and their hiring staff and requirements. Each of these web sites will lead you to ten more. Buyer, beware! Some of these organizations exist only to take your money and give you very little in the long run. Due to this glut of resources and the high quality of training at American universities and conservatories, we have more professional performers in the market than ever. According to the RAND Corporation: The number of Professional Performing Artists has doubled since 1970. Professionals are created based on willingness of arts organizations and producers to employ them. There are over 3000 managed singers in the US as of 2009. In our field singers come in two categories: Professional (paid to sing- either managed or unmanaged) and Amateur (un-paid) that can be broken down into subsets: casual hobbyists, amateur aficionados, part-time professionals, full-time professionals, and superstars. The distinctions among these categories would be based on multiple criteria, including artists’ educational qualifications, membership in credentialing bodies, income earned, amount of time devoted to performing, and peer acceptance. The bad news is that over the past 10-15 years though the number of well-trained professionals is risen dramatically, the number of well-paying performing/opera jobs has diminished. According to the RAND Corporation performing artists face more difficult employment circumstances than do most other professionals. So who is hiring singers? Generally, performance venues are way up but profits are down. More performers are in the market and consequently are also on the stage, but they are making less money. The numbers of opera companies, performing arts series, orchestras and performing arts venues seem to be healthy. There are more performance venues than ever and the most prevalent type of performances are musical ones. The Association of Performing Arts Presenters has reported the types of organization that present the performing arts. Ironically, the venue that does most presenting of music and opera by far (a whopping 37%) are colleges and universities who do not have performing arts as their mission, but rather education. 1. Musicians and Composers make 10K American dollars on average by working 48 weeks per year. These are SUCCESSFUL professionals either full or part time. 6. very few make it big in the field but many are inspired by success of superstars. Advances in reproduction and distribution in the recording industry, broadcasts of live operas in the movie theatres, marketing of opera singers to commercial venues and movies, getting a few big names out to millions of people. More pervasive marketing due to higher potential income of superstars. The presence of the superstars is a strong force in the arts labor market just as it is in sports and business. Although these stars represent a tiny fraction of the entire professional workforce, they offer a powerful incentive for aspiring young artists to go into the profession. This superstar market trend has fueled the increase in revenues for large companies, brought more audiences into the theatres, and inspired more and more students to study singing in hopes of becoming a superstar, which sends more and more potential singers to school, creating a glut in the number of singers that graduate into their Apprentice Years and add to the pool of Professionals from which managers and promoters can choose talented singers to make into big stars which makes money for the companies and starts the cycle all over again. The superstar market trend is still going up forcing wages of all other singers down. This will not change anytime soon. Though the internet has helped create and propel the superstar market forces in opera, it also provides a much lower standard to enter the field through independent websites, record distribution, and self-promotion to niche markets. Many already think of the Internet as a venue for performing arts, the result being a wildly un-juried mish-mash of singers on youtube.com at the low end and free web sites for classical singers such as Classicalsinger.com and YAPTracker.com on the high end. Fewer and fewer performing artists must go through the intermediary of the manager/promoter or producer to get their work to their audiences. Through the Internet, the Apprentice Singer has the possibility of bypassing the manager/promoter and taking her work directly to her audience. The second good trend for singers is the rise of employment opportunities for teaching artists. If you have an interest in teaching – going back to school for a doctorate is a good option and is necessary for a university teaching career. University teachers were the first teaching artists! With the numbers against the performing artist, singers might consider other parallel career paths might include: stage management, singer management, and singer marketing. Add another passion to your singing and create a business out of both. Some examples might be Teaching and Singing, Yoga and Singing, or Cooking and Singing or even Selling Books and Singing. The many new small opera companies provide venues for more interesting and edgy repertoire and will help the young singer build her resume and gain skill as a performer for free. So, what should the aspiring singer in her apprentice years be doing? Practice every day like you have an audition tomorrow because you might. Get ready. Training is never lost. Know the industry standards and where your skill level is right now. Audition and perform as much as possible while you learn the business. You need 10,000 hours to be a professional. Give yourself a leg up by knowing how to build your own business. Get to know the business trends in your field. Learn how to play to your strengths in marketing yourself. Learn how to make and keep contacts by networking. Learn how to take care of your money. Learn roles and marketable repertoire so that you have something to market (use the small companies as free training ground). When you are ready, make your move - knowing the odds. Have a plan for time and money. Here are some options for your big leap: Go to NYC for fall auditions. Move to NYC to audition for a few years. Go to Europe for a year of auditions. Move to Europe for a few years. Audition for Management. Settle in one city and start career there by free-lancing, being a teaching-artist, starting your own business, etc. Consider the definition of success. Define success for yourself as artistic and professional excellence. Keep singing no matter what (keep getting better). Develop your role of “artist as citizen” by creating venues for yourself &amp; others to perform in your own community. Record your repertoire and distribute it over the Internet. Be the superstar of your own life. Remember that the love of the art is why you are here, not fame or fortune, and forego disappointment by singing better and better your entire life as that is your only real chance to become a professional or a superstar anyway. So to all the Apprentice Singers in the middle years I offer this quote from Albert Einstein.